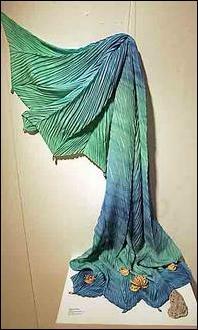 Aqua Sea Wrap, a pleated wrap in silk by Wilma Butts, descends into a base of Denise Jeffrey's porcelain sea creatures in their shared show Freewave. Denise Jeffrey's porcelain seaweed platters match the shibori silk sculpted sea onions made by fibre artist Wilma Butts in their shared exhibit Freewave at the Craig Gallery, Alderney Landing. Above right is a detail from Jeffrey's triptych of porcelain tiles, Adoration of the Octopi. Two local artists explore ocean environment. Wilma Butts and Denise Jeffrey both switched careers to become artists. Neither has ever looked back. "Not for a minute," says Jeffrey, a studio potter in Minesville. "I'm absolutely passionate about it." She recalls her first day as a mature student in ceramics at NSCAD University. "I'd never touched clay before," she says. "Sitting at the wheel, I was the oldest student there, I couldn't get my cylinder going up and I was having the most fun I'd ever had in my life." She exhibits with Halifax fibre artist Wilma Butts in the show Freewave at the Craig Gallery, Alderney Landing. The two explore the ocean environment in Jeffrey's porcelain sculptures and Butts's scarves and wall hangings in cotton, silk and velvet. Both women grew up by the sea. Both volunteer on committees with the Nova Scotia Designer Crafts Council, which is how they met, and both make their living selling functional crafts. Jeffrey sells carved porcelain vessels through d. Digs Pottery. Wilma Butts, a native of Glace Bay who worked in marketing before switching to textiles in 1998, sells "art to wear" under the name Arashi. "It was two years ago we started to talk about this," says Butts, sitting in the gallery. "The combination of clay and cloth is a traditional pairing because both are relatively ancient crafts. People have been doing clay and fibre work for thousands of years." Butts uses an ancient dye technique called shibori, which comes from the Japanese verb "shiboru," meaning to wring or squeeze. Shibori involves pleating, stitching, wrapping and binding fabric during the dyeing process. "Shibori techniques have been practised for thousands of years by many different cultures," says Butts. "The patterns it creates are highly organic. When people look at my art-to-wear pieces, they say they see water or sky." Butts decided to push her work even more in the direction of oceanic patterns. She has created a rippling blue scarf that ends in delicate three-dimensional bubbles that look like sea foam. "This show gives me a chance to expand and explore a lot of different themes." She experimented in a technique called scouring, which removes proteins from silk to get different textures, colours and patterns within the one piece of fabric. Colour adheres more strongly to protein; the portions of silk stripped of protein look washed out and eroded in Butts's piece Iridescence, of two back-to-back pieces of shimmering patterned silk so delicate a whisper could make it move. The pattern recalls fish scales, rippled sand, water, even striations in rock. Jeffrey also used the exhibit as a chance to experiment by developing a completely new and glossy glaze palette away from her deep matte greens. "I did 66 glaze tests before starting," says Jeffrey. "I've never had this kind of detail or palette." Her Adoration of the Octopi triptych is a painterly depiction of sea life in amazing detail. Attached to the surface of the clay "painting" are tiny thimble-sized sea creatures that have even tinier threads of clay sprouting from their tops. Jeffrey pressed coral into the clay to create rock texture. She used a wire brush to draw in scrawling water lines, and she carved into the clay, which she does a lot in her production work. "The triptych is originally a Christian device for carrying portable altar pieces," says Jeffrey. Her title refers to the Adoration of the Magi. "Minoan pots were decorated with octopus. There is that ceramic reference too," says Jeffrey. 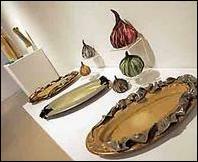 She often refers to ceramics history in her work. "I studied under Walter (Ostrom), so I took four to six art history courses. My regular body of work references Asian stuff." Jeffrey grew up in Meadowbank, outside Charlottetown. "I'm an ex-scuba diver, I spent time sailing. As a kid I dreamed of being a marine biologist." Jeffrey wanted to explore the sea "from the surface, from underneath, from the seashore and from the imagination," she says. Her spiny critters on the back wall are "like nothing I've ever seen before." One creature of spikes has a centre of a red velvet shibori scarf, inspired by the mouths of sea anemones. This exhibit can be as literal as Slick, an environmental piece about the illegal dumping of oily bilge water from passing ships, which Environment Canada says kills 300,000 seabirds each year off the coast of Atlantic Canada. Jeffrey made a three-dimensional sea duck and placed it on sand-coloured tiles within a shallow wooden box by Stephen Gould of Sambro. Hanging above it is Butts's Black Nature banner of scrunched, rippled cotton in blacks and silvery sand colours, a piece Butts did unconnected to Jeffrey's Slick. However, "if you see an oil slick on the sand in the light there are a lot of these colours there," says Jeffrey. "Until recently it was easier to ignore the darker side," she says. Now, "you cannot go to a beach anywhere in the world and not come upon man-made garbage. This is the one in-your-face piece." Butts says: "We wanted to draw people's attention to the beauty of it and be more thoughtful of the ocean, and this is a reference to what can happen if people aren't thoughtful of the ocean environment. The beauty is there, but it's easily destroyed." Other works are lyrical and fanciful, with a pairing of Butts's playful sea onion sculptures in seaweed colours with Jeffrey's seaweed platters. "I just wanted to do a sculpture in cloth," says Butts. "They just evolved and then they looked like onions when they were done." The two were inspired by the tropics for a mobile of hanging porcelain coral with twists of pink, yellow and turquoise silk. Freewave is the name for a giant length of sea blue fabric, scoured silk organza that cascades down from the ceiling and ends in a pool with Jeffrey's sculptures of sea creatures and oyster shells. "As people walk around it, they'll get the effect of the tide sort of rolling in," says Butts. The two artists didn't plan exactly how their work would connect until they got to the gallery. "We were amazed when we got here and set up the show, because I hadn't seen these pieces," says Butts. "We were amazed how the colouring and texture refer to one another." Jeffrey says: "We hope people will take the time. It's similar to the ocean - you have to look. You have to look deep." Freewaves is at the Craig Gallery, Alderney Landing, Dartmouth, to July 24. Gallery hours are Sunday, 11 a.m. to 4 p.m.; Tuesday to Thursday, noon to 5:30 p.m. and Saturday, 9 a.m. to 5 p.m.